Defects in the paving slabs had been previously reported to the housing association responsible for their upkeep but to no avail. So when our client tripped and was injured a successful compensation claim was made. 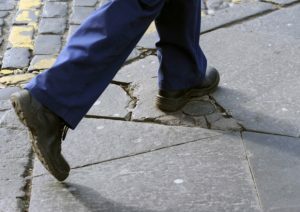 Our Lawyer took on the case and pursued a claim against the housing association who had failed to act on previous complaints about the hazardous pavement. Our client was helping her mother to the car when she tripped on a defective paving slab, as she put her foot on one slab it sunk, exposing the raised edge of an adjoining slab. Client reported the matter and the defective slab was rectified the following day. Our client received £2,500 compensation for the injuries she incurred. This article was added on Wednesday, April 15th, 2015 at 5:11 pm and is categorised under . Both comments and pings are currently closed. Error: Error validating access token: Session has expired on Saturday, 09-Mar-19 13:12:58 PST. The current time is Thursday, 25-Apr-19 10:04:43 PDT.